Defender Mark Scoltock believes the Institute squad showed the determination and drive in their narrow defeat to Ballymena United, to show people that there's still life in the club. With boss Paddy McLaughlin along with the back-team and midfielder Aaron Harkin all leaving for Cliftonville and skipper Michael McCrudden deciding to stay away from the club, as he tries to force a move to Derry City, Scoltock was pleased that the players didn't let all the off field stuff effect them and instead just got on with things. 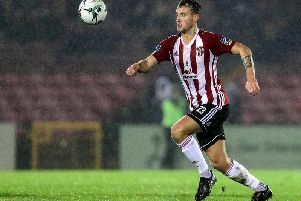 The big centre-back, who joined caretaker manager Kevin Doherty and former team-mate Eamonn Seydak on the Stute bench, admitted he received some bad news this week signalling the end to his season, but he concedes moving into the coaching game is something, which he is enjoying.